Sleep. It’s one of the few things in life that is abundant when you don’t want it and elusive when you need it most. It’s ironic when you think about it. At bedtime, my toddler kicks and screams, begging to stay up longer, while I fight to keep my eyes open. My kindergartener counted the days until he was “old” enough to not take daily naps; I love the guilty pleasure of sneaking in a nap on a lazy Sunday afternoon. My college-aged nephew is too busy with friends to sleep much at night, but good luck trying to drag him out of bed in the middle of a sunny afternoon. My 72-year-old uncle worked hard all of his life so he could retire and relax, but now even medical assistance can’t guarantee him a good night’s sleep. Some say it’s the circle of life, that poor sleep is simply a normal part of aging. But seniors don’t have to trade in sound slumber with age. Although the ideal number of hours of sleep we need per night varies from person to person, senior adults generally require about the same amount of sleep as younger adults. However, according to WebMD, more than half of men and women over the age of 65 complain of at least one sleep problem, and many suffer from multiple disorders. The result is that most seniors get much less sleep than their bodies need. Light sleep: Seniors who suffer from light sleep report experiencing less deep sleep and less restful sleep, often feeling tired when they wake up. Sleep apnea: Various medical conditions can make breathing difficult. Sleep onset insomnia: This condition makes it difficult to fall asleep. Sleep maintenance insomnia: Many seniors can fall asleep but are unable to sleep through the night, often because of other medical conditions or psychological factors. Poor sleep habits: The body of a senior adult has a difficult time adjusting to irregular sleep schedules. Erratic bed times negatively impact the body’s circadian rhythm and make falling and staying asleep a challenge. Daytime napping and spending long periods of time in bed while still awake can also affect the body’s ability to fall asleep regularly. Sleep disorders: Many seniors suffer from sleep apnea, restless legs syndrome and insomnia. Often, it is difficult to determine if these disorders are initially caused by age or by other mitigating factors. 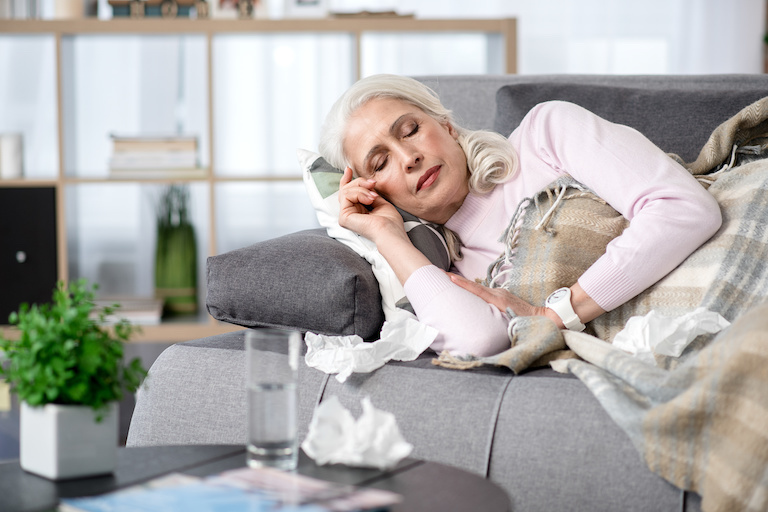 Medications: Certain medications make falling – and staying asleep – difficult. Some medications even act as stimulants, making sleep almost impossible. Even sleeping pills are not viable long-term solutions. They can produce undesirable side effects, including impaired memory, imbalance, incontinence and daytime sleepiness. Psychological distress: Many elderly people deal with major losses, challenges and life changes – like the death of a loved one, the frustration of physical limitations or the move from a family home. These emotional barriers can affect the quantity and quality of one’s sleep. Lifestyle changes: For many seniors, retirement brings major changes, including excess down time which can mean less daytime activity, boredom and even malaise. This lack of activity can lead to an irregular sleeping schedule and, ultimately, chronic sleep problems. Although all sleep problems cannot be eliminated, many of them can be avoided or minimized by identifying their causes and countering them with healthier sleep habits. Set a daily sleep routine: No matter how old you are it is important to get on a sleep schedule that works for you and stick to it. Try to go to bed at night and wake up each morning at around the same times. Your body will be under less stress because it is not constantly adjusting itself to new sleep patterns. Stay active: Regular activity at all ages prepares your body for deeper sleep at night. Not only do exercise and activity help you fall asleep quicker, they help you sleep more soundly. Also, when you are awake, try to stay out of bed as much as possible. Train your body to associate your bed with sleep, not wakeful activities. Enjoy the sun: Sunshine helps regulate your sleep/wake cycle. Get as much of it as possible, either going outdoors during the daytime or sitting indoors in a sunlit room. Minimize naps: Avoid taking long naps during the daytime. If you do want – or need – a nap, keep it at 90 minutes or less and avoid napping late in the afternoon. Avoid nighttime snacks: Late-night snacks energize your body and can make falling asleep difficult. If you are hungry late in the evening, keep it light – and healthy – and milk is the best beverage choice. It contains the amino acid L-tryptophan, which research has shown can actually help people go to sleep. Avoid drinking caffeine within six hours of bedtime. Don’t worry: When it is time for bed, try to avoid worries or dwelling on upsetting topics. Avoid discussing emotional issues in bed. Instead, focus on something restful, like reading or relaxation techniques. The reality is that getting older doesn’t have to mean getting less sleep. If you get less sleep than when you were younger but still feel rested when you wake up, then it is possible that you simple need less sleep now. However, if you are often fatigued and think you suffer from sleep problems, take the initiative to seek a better night’s sleep. Many sleep disorders are preventable. Consult your doctor to see what might be causing your sleep problems and to identify ways to improve the quantity and quality of your sleep. You’ll be amazed at how a few simple steps can turn never-ending nights into sweet slumber.